There are certain stories that unite us all. Through telling stories, we feel connection, and similarity, yet can also define and create our stories through our own uniqueness. No one else can write the story of our life – its what makes us unique, yet we all can relate to certain themes and feelings. When we tell our story, we are asking for attention from those we care about or wish to affect. I was so excited to do an interview with Robert Sharpe, on BITE Radio, about the power of sharing our stories. Give it a listen and find out why you have a story to tell, and how to start sharing it! You can also listen to it at BITEradio. Also check out my interview from October 7th, 2014 getting ready for my one-woman show Gutless & Grateful. So why are stories so important? Telling our stories helps us process what happens in our lives. Through our shared experience, we can heal. It’s not the details that matter – suffering is relative. By sharing our stories, we can connect with others who feel the same way. We suddenly feel less alone, in our ever-unfolding narrative. 1.) Make a mantra: When the weather’s beautiful out, I love taking nature walks and reciting this mantra to myself: breathe in experience, breathe out your story – Breathe in. When you exhale – what is that truth you are aching to express today? 2.) Read a children’s book: Does anyone remember this book? All it is is white splotches – clouds – and it’s up to you to decide what shapes these “clouds” are taking. Children’s books make stories out of anything even white splotches! There’s nothing like a kid’s book to get your mind thinking like a storyteller. Pick a good kiddie read and find the adventure in your own life. 3.) Write a line a day: This little book is the best investment I made. For me, the idea of “journaling” every day is daunting. Will I really have time to commit? This is a little journal where there’s literally only room for ONE line – and it’s for five years! It makes me a bit teary-eyed lookiing back on mie – I’m on year four already. If I go to the very first entry, it’s after my worst surgery. The next year I’m doing my show. The next year I met Brandon. The next year I’m a wife! I can’t recommend a journal like this enough – It’s your story…in time-lapse mode! 5.) Send a card just because: Snail-mail. Ah, how I miss it. I love sending cards because, well, they give me an excuse to write! With a pen – how old fashioned. Today, send a card to a friend, just because. Thank them for the impact they’ve made on your life – big or small. In doing so, you’ll share with them how they’ve become part of your story. And connections make our stories stronger! And while you’re at it, please do vote for which artwork of mine you’d like to see as a greeting card for my Etsy shop! 6.) Be in the moment. You don’t always know you’re telling a story as you’re living it. This was a painting I was making inspired by a wet, paint-stained paper-towel. And what do you know…it turned into something! 7.) Talk. Simple, I know. But speech is healing – and not always as easy as it seems. I learned that first hand when telling the difficult story of my abuse. Talk about difficult things, and talk about happy things too. Heck, Pharrell made a whole song about that. 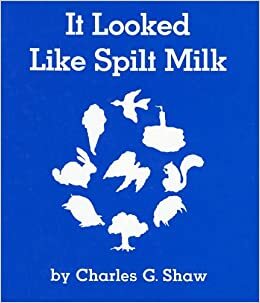 Remembering the “It Looked Like Spilt Milk” book reminded me how much books meant to me as a child. Do you have a book you read growing up that always sticks with you? Let me know in your comments, and then check out this link and tell me how many you’ve read! On the topic of books, some of these looked interesting too – has anyone checked these out before? Which step are you starting with today? Everyone has a story. After Amy’s was featured on TODAY with Kathie Lee and Hoda, she was inspired to bring hers to the NYC stage in 2012. Ever since, it’s been Amy’s hope to bring out the stories that unite us all. Do you have a story you’d like to share? What has the power of words helped you overcome in your life? Send me a note to be featured on this page! Telling our stories helps us process what happens in our lives. Through our shared experience, we can heal. It’s not the details that matter – suffering is relative. By sharing our stories, we can connect with others who feel the same way. We suddenly feel less alone, in our ever-unfolding narrative. If we don’t tell our stories we feel disconnected in a realm of uncertainty and fear. Telling our stories brings subconscious thoughts, repressed memories and emotions to light. When we are able to embrace every part of us – broken and the brilliant – we can move on wholly. Amy’s realization that we all need to tell our stories inspired her to perform her one woman musical Gutless & Grateful, as well as leading workshops about the healing power of our stories, the transformative power of words, manifesting success through creativity, and cultivating joy through gratitude. Through telling our stories, we create a roadmap where there is none, and we find that lantern to guide us home. I have been journaling ever since I could read and write. I have so many memories and so many stories already written down that I hope to make a book out of them to give to my future children when they turn 18. I love the art of stories and story telling and feel that it is so important to have stories. This is such a great post! Thanks for sharing! I agree that telling our stories is important. I’m working with my students to get them comfortable telling their stories. I like the idea of having them think about music. I’m going to have to try that with them…perhaps tomorrow. This is wonderful. I like reading children’s books also and taking a walk. I’ll keep these in mind. This is truly a wonderful article. So much great advice. I have tried journaling… I just can’t seem to make it work for me. Maybe the line a day will work great. After all, journaling is supposed to be the best thing for anxiety, panic, insomnia, depression and other types of chronic mind numbing ailments that plague us all. Storytelling is a great way to share with others and feel positive about ourselves in the process. I think that’s why I blog. You are a very creative person and I look forward to reading more from you! These are great tips for sharing our stories. I agree…they are so powerful, both for us to share and for others to hear. This article is packed with so much practical advice, thank you for that! I absolutely believe telling our stories is important and a way to come to grips with who we are and what we stand for in the world. As a life coach I find that the more people tell their stories, and more importantly, hear their own stories told back to them, the more they are able to grow and understand who they are. Lovely tips, great ideas. I’ll definitely put them to practice. Thank you. I love the idea of writing one line a day. Takes the pressure off and before you know it you have started and it’s so much easier to continue. Thanks for the pointers! Love your artwork! Thank you for sharing with us at #JoyHopeLive!